OSP seeking info on the other vehicle, which cut in front of the Subaru just prior to the accident. 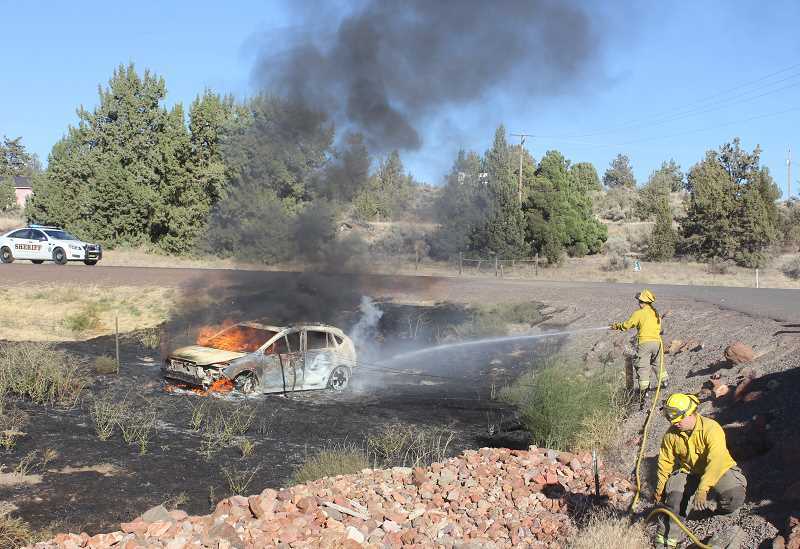 A Subaru Cross Trek left the road and burst into flames on U.S. Highway 97 at NE Elm Lane, five miles north of Madras, Sunday, but both occupants escaped the flames. According to the Oregon State Police report, on Sept. 2, at approximately 5:15 p.m., an orange Subaru Cross Trek was northbound on U.S. 97, when it was passed by a late model dark color sedan. The sedan cut in front of the Subaru, forcing the operator to swerve and brake hard to avoid a collision. The Subaru left the roadway, crashed through a fence and caught fire in a field. The operator was taken to St. Charles Madras for medical evaluation. The accident occurred at a Madras Pioneer reporter's house. Both the woman driver and her male occupant told the reporter they were Madras residents. They said their air bags had deployed and they were sitting in the car, when another driver ran up and told them to get out because their car was on fire.